Tim Burton, quoted in M Salisbury, Alice in Wonderland: A Visual Companion, Disney Editions, New York, 2010, p.3. The first line of Lewis Carroll’s Alice’s Adventures in Wonderland sets out exactly what kind of book it will be. Young Alice, disgusted by her older sister’s reading matter, considers the pointlessness of a book without ‘pictures or conversation’. Carroll commissioned Punch’s political cartoonist, John Tenniel, to provide pictures for his text, although those illustrations were influenced by the sketches in the author’s manuscript. 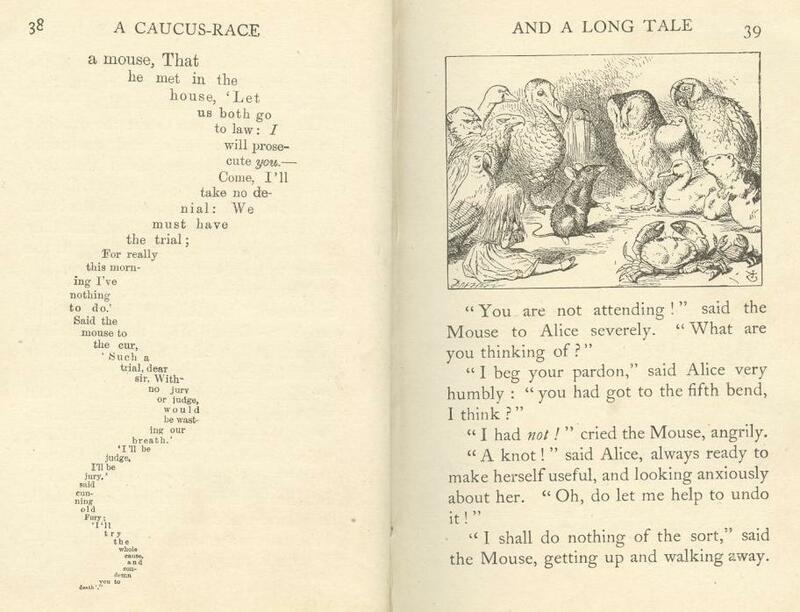 Carroll also supervised the layout of the book – including typographical flourishes such as the ‘Long Tale’ in the shape of a mouse’s tail – and the exact placement of the drawings alongside the text. The result is that the book is a sequence of images as much as a text narrative, pictures as much as conversation. Tenniel’s artwork also appeared in tie-in merchandise, including biscuit tins and board games, allowing the visual elements to take on their own independent life in children’s imaginations. Stage adaptations, and a set of coloured magic lantern slides from 1900, copied Tenniel’s designs too (although in the case of the slides, with enough small changes to not incur copyright difficulties). No surprise, then, that Alice proved a suitable case for early film adaptation. Three silent versions were made between 1903 and 1915, plus a series of 57 one-reel Alice comedies from Walt Disney made between 1923 and 1927, which combined live-action with animated sequences. In the Disney shorts, which veer far from Carroll’s text, Alice is played by a young actress (initially Virginia Davis) and she goes on adventures in animated dream worlds, accompanied by a cartoon cat called Julius. Many of the scenes were shot in the grounds of Mount Felix in Surrey, a smart country house that was close to Hepworth’s studio, giving a suitable grandeur to their appearance. While the film’s brief running time condenses and edits Carroll’s text, the costumes and sets are impressively faithful to Tenniel’s illustrations. Mabel Clark as Alice is cramped inside a house, jabbing her hand out of a leaded window adorned with a neat net curtain, the White Rabbit wears a checked jacket, and a phalanx of children are dressed as playing-card soldiers. The film was also notable for employing in-camera special effects, allowing Alice to shrink and grow and fall down a rabbit-hole (albeit horizontally), and the Cheshire Cat to appear and disappear. Due to its length and spectacular appeal, as well as the episodic nature of the source material, Alice in Wonderland was rented out in pieces so exhibitors could show a single scene in a bill of short subjects. It has proved perennially popular. An edited version of the film on the British Film Institute’s YouTube channel, running at three minutes, went viral in 2010 after the blogger Perez Hilton posted it on his site, exclaiming, ‘It's over 100 years old! … pretty amazing for 1903’. The 1910 US adaptation, Alice’s Adventures in Wonderland, a single reel directed by Edwin S Porter for the Edison company, progresses in a similar fashion to the 1903 film, with smoother visual effects, better lighting, greater momentum in the (vertical) rabbit-hole tumble and a few short quotations in the intertitles. Again, fidelity to Tenniel’s imagery is prioritised, with many of the scenes, including a beautifully staged Mad Hatter’s tea party and the croquet game, showing impressive attention to detail. A young Gladys Hulette plays Alice with great charm. In the opening scene, when she spies the White Rabbit (who is yet to appear in frame), she lifts her hands to the side of her head to create ‘bunny ears’ – a sweet pantomime that capitalises on the audience’s familiarity with the text, although the rabbit’s appearance has of course already been signalled in the opening intertitle. More ambitious is the 1915 Alice in Wonderland. Adapted and directed by WW Young for the Nonpareil Feature Film company, the film was subsequently re-released in 1924. Following Clark and Hulette, child star Viola Savoy plays another brunette Alice in this feature, which is around an hour long. Although this production again cleaves closely to Tenniel, including giant papier-mâché heads for grotesque characters such as the Duchess and the Queen of Hearts, we are finally also treated to chunks of Carroll’s text, both quoted in the intertitles, and via the inclusion of literary setpieces such as Alice’s mangled recital of ‘You Are Old, Father William’ which is enacted in full – geriatric handstand and all. Animal costumes abound, most notably in the film’s version of the Pool of Tears and the Caucus-race, in which birds and beasts assemble for ‘The Animal Convention’, an invention by Young, which sounds far more 20th century American than 19th century British. Despite the eccentric omission of the Mad Hatter’s tea party, this is a spectacular visual presentation of the story, culminating with such surreal sights as Alice on the beach conversing with a full-sized Gryphon and a Mock Turtle, followed by the walruses and lobsters performing their famous quadrille. The flights of fancy in the film are brought down to earth by its framing sequence and its rather literal application of dream theory (a strategy emulated with varying success by later adaptations including Tim Burton’s 2010 version). The film opens, not with the girls drowsing by the riverbank, but in an American farmhouse, with a real-world sequence including freshly baked jam tarts (Alice resists the temptation to steal one), playing cards, a cloud of pepper, a cat in a tree, a white rabbit and even a baby pig. As an intertitle explains, ‘Things we do and things we see shortly before we fall asleep are most apt to influence our dreams’, and these elements will surface in Alice’s adventure, which begins in the bluntest fashion with a signpost pointed ‘To Wonderland’. These first screen Alices, and their ‘reverent fidelity’ to Tenniel’s designs can all, like the magic lantern presentation, be viewed as adaptations not just of Carroll’s story, but replicas of the visual experience of reading the Gesamtkunstwerk book itself, which so successfully combined text and image, pictures and conversation. This is an essay from the Wonderland exhibition catalogue, published by Thames & Hudson. Buy it here. CM Hepworth, Came the Dawn: Memoirs of a Film Pioneer, Phoenix House, London, 1951, p. 63.